Wind mitigation is the use of certain building techniques that limit damage caused by intense wind, such as hurricanes. Here in the Jacksonville and St. Augustine areas, our homes and businesses are at risk for damage by wind not just during hurricane season, but in the winter, as well. Wind mitigation has become increasingly important for homeowners in the Jacksonville region, as insurance companies look to decrease their risk, Some insurance companies will raise rates for homeowners who do not meet the latest state standards for wind mitigation. There are also some incentives available to help St. Augustine and Jacksonville homeowners make improvements to their homes for wind mitigation. This is the only inspection that can help lower your homeowner’s insurance. In Florida, the portion of a home owner’s premium covering wind damage can be up to 70% of the total, depending on the location. Home insurance companies focus on evaluating and handling risk. So in the state of Florida where strong winds can cause serious damage, you should expect an insurance premium. However, by getting a wind mitigation report with your home inspection, you will be able to cut these expenses. A wind mitigation report is provided after a home inspector performs a wind mitigation inspection, and includes techniques to make your home less vulnerable to the risks brought by strong winds (for example, roof deck attachment or other construction features). By taking good care of windows, doors, walls, and roofs, your home can be prepared for these winds. In some states, homeowners can benefit from reduced insurance premiums. Following Hurricane Andrew, Florida passed a law requiring insurance companies to offer their customers discounts and credits for existing building features and home improvements that reduce damage and loss from wind. To qualify for this discount, homes must undergo a certified home wind inspection. However, many Floridians do not know of this law. Those with windstorm insurance can avoid a costly deductible. Deductibles for homes in hurricane-prone areas can exceed $20,000, meaning that mild to moderate wind damage might not be covered by insurance at all. If proper wind mitigation techniques have been used, these expenses can be avoided. Wind mitigation helps protect the home from damage. Even if a home is insured, it is always costly when a house is damaged, both for the homeowner and the insurer. Repairs can take months, especially during material shortages that often follow hurricanes and storms that destroy entire communities, as was the case after Hurricane Katrina. These commonly fail during windstorms due to inadequate door-track strength and mounting systems and flimsy metal panels. Glass doors and windows should be replaced with impact-resistant glass. They should be structurally attached to the building to prevent the entire window from popping out of its frame. Sliding glass doors are especially vulnerable to flying debris due to their large expanse. Once an opening is created during a windstorm, the pressure within the house can rise high enough to cause the roof to fail in areas of low pressure. The picture to the right demonstrates how these areas of low pressure can form. There are many kinds of roof covering materials, and some resist wind damage better than others. The most common roof covering materials in Florida are composition shingles and tiles. A key factor in roof covering performance is the method of attachment of the roof covering material to the roof deck. Nails, not staples, should be used to fasten these materials. “Roof shape” refers to the geometry of the roof, rather than the type of roof covering. The end-walls of gable roofs extend vertically to the sloping roofline. These gable end-walls, if not properly built or braced, have been known to fail outward due to the negative suctions on the wall. Additionally, field testing has shown that hip roofs receive up to 40% less pressure from wind than gable roofs. hurricane clips/straps that hold the roof structure to the walls; and protection of windows and glass doors with impact-resistant glazing or other protection systems. This connection is a critical safeguard that keeps the roof attached to the building and acts to transfer the uplift loads into the vertical walls. This connection is crucial to the performance of the building due to the large negative pressures acting on the roof. Proper installation is essential to connector performance. In 2009, InterNACHI developed a wind mitigation certification program for inspectors. It is approved by most insurance companies and the Florida Construction Industry Licensing Board. 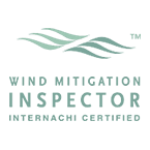 Inside & Out Property Inspectors, Inc. has completed this additional training and is certified to conduct wind mitigation inspections.